One of the most popular scuba diving courses in the world, the Open Water Diver course in Goa gradually introduces you to the fascinating underwater paradise of tropical Goan waters while teaching you the proper skills and methods of scuba diving. The course begins with classroom sessions conducted by a certified dive instructor, and proceeds into training sessions where you get comfortable with diving inside a swimming pool. The course continues as you travel to the dive spots around Grande Island to undertake four open water dives, during which you'll perfect your dive technique and have fun swimming alongside brightly coloured fishes. NOTE: As part of the course, travellers are required to swim for 200 meters and float for 10 minutes. Your dive centre is located close to the Calangute beach, one of the more popular beaches of Goa. However, you'll travel to the dive spots near the Grande Island for your open water dives. Located 1-hr boat ride away from mainland Goa, the waters of the Arabian sea near the Grande Island are a hotspot for scuba divers. Swim alongside schools of small, brightly-coloured species of crustacean and coral reef fish, and explore the underwater beauty of the sea, with water tinted with shades of blue and green. • Get certified as a SSI Open Water Diver after successful completion of the course. • Learn scuba diving in a small group with personalized attention. • Go underwater at dive spots teeming with coral reef fish. • Learn the intricate skills and techniques of scuba diving. Travellers are required to sign a liability and indemnity form before the Open Water Diver course in Goa. Travellers are required to adhere to instructions of the dive instructor during the trip. For cancellations made 15 days or more before departure of the Goa Open Water Diver course: 75% refund. For cancellations made less than 15 days before departure of the Goa Open Water Diver course: No refund. Drop-outs on Day 1 of the Goa Open Water Diver course: 65% refund. Drop-outs on Day 2 of the Goa Open Water Diver course: 50% refund. Drop-outs on Day 3 or 4 of the Goa Open Water Diver course: No refund. Unsuccessful completion of the course due to failed swim test or medical check-up: No refund. As part of the course, travellers are required to swim for 200 meters and float for 10 minutes. Travellers will be sent a medical questionnaire, after confirmation of the booking. Depending on the answers, travellers may be required to obtain documented doctor's clearance allowing them to participate in scuba diving. This allows dive instructors to customize your experience and ensure your safety. The tour operator reserves the right to cancel or alter the itinerary of the Open Water Diver course in Goa to ensure maximum safety for travellers as well as staff. No pick-up for this Goa Open Water Diver course. No drop-off for this Goa Open Water Diver course. Arrive at your dive centre in Goa by early morning. On the first day of your course, you'll begin by familiarizing yourself with the theory of scuba diving, going through various dive techniques and skills. A certified dive instructor will conduct classroom sessions with you, where you'll go through 5 modules of theory learning the intricate details of diving from what happens to the human body during a dive to what purpose each scuba equipment serves during a dive. Your day ends by late afternoon. Spend the rest of the day at leisure. Swimming pool, at the Goa dive centre. Arrive at your dive centre in Goa by early morning. After a quick refresher, you'll enter the swimming pool, along with your dive instructor. You'll practice the theory and cement your understanding of dive technique. Wearing the scuba suit, you'll go through the 5 modules of pool training, each corresponding to a section of the theory. You'll spend time in the swimming pool to get comfortable with the equipment, ahead of the big day tomorrow. Your day ends by late afternoon. Spend the rest of the day at leisure. Learn the hand signs to communicate underwater. 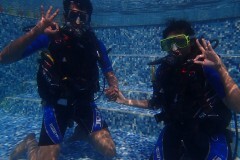 Day 3 of Goa Open Water Diver course: Go diving! 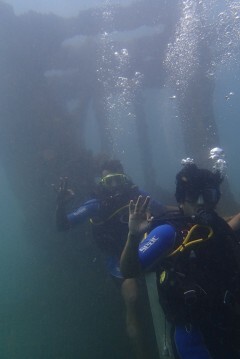 Arrive at the dive centre in Goa by early morning. After a quick briefing, you'll hop into boats and travel to the dive spots near the Grande Island. 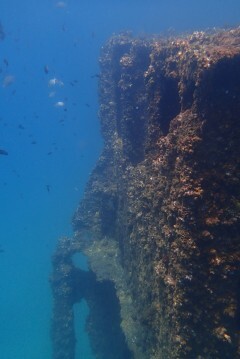 Here, you'll complete two open water dives of 45-min each, during which you can go a maximum of 60-feet deep. Your dive instructor will work with you to help improve your dive technique and learn new underwater navigation skills. Return back to mainland by early evening. Spend the rest of the day at leisure. Complete two of your four open water dives. 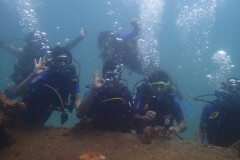 Day 4 of Goa Open Water Diver course: Go diving! Arrive at the dive centre in Goa by early morning. After a quick briefing, you'll hop into boats and travel to the dive spots near the Grande Island. Here, you'll complete two more open water dives of 45-min each, during which you can go a maximum of 60-feet deep. During each dive, you'll demonstrate your skills and put some finishing touches to your dive technique. Return back to mainland by early evening. At the dive centre, you'll have a short quiz before completing the paperwork for your certification. Your trip ends here. Swim alongside schools of brightly-coloured fish. Personal expenses like tips to staff, meals or beverages etc. The dive centre, near Calangute, is accessible via 1-hr drive from the Goa International Airport and Thivim railway station. You may board a flight to the airport or take a train to the railway station and hire local taxi/car to travel to the dive centre.